Did you almost slip and fall on your extra slick floor with the new mysterious sheen recently? Perhaps your toddler has been cleaning again. 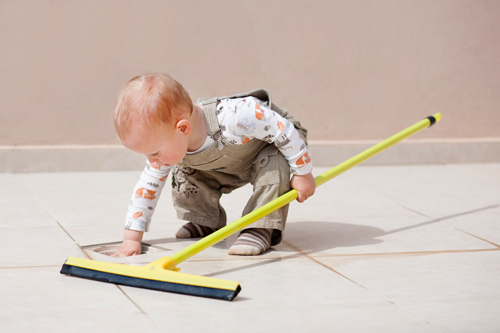 At this age toddlers begin to emulate roles they see others in. They may see you vacuum, dust, or mow the lawn and then do the same. These new found “skills” (don’t worry we’ll work on honing them later) indicate progress toward building relationships with other children. An ability to copy others is an important part of social emotional development. More examples of progress and quick tips to support it follow. try to comfort crying children. help toddlers engage in pretend play by providing play dishes, cars, animals, and other toys. What items does your child enjoy to play with the most? Cars, animals, books, dress-up clothes?